HEATHER MAC DONALD is the Thomas W. Smith Fellow at the Manhattan Institute and a contributing editor of City Journal. A non-practicing lawyer, Mac Donald has clerked for the Honorable Stephen Reinhardt, U.S. Court of Appeals for the Ninth Circuit, has been an attorney-adviser in the Office of the General Counsel of the U.S. Environmental Protection Agency, and a volunteer with the Natural Resources Defense Council in New York City. The New Jersey State Law Enforcement Officers Association conferred its Civilian Valor Award on her in 2004. She was awarded the 2008 Integrity in Journalism award from the New York State Shields. She was also the recipient of the 2008 Eugene Katz Award for Excellence in the Coverage of Immigration from the Center for Immigration Studies and the 2012 Quill & Badge Award for Excellence in Communication from the International Union of Police Associations. Her writings have also appeared in the Wall Street Journal, Washington Post, New York Times, The New Republic, Partisan Review, The New Criterion, Public Interest, and Academic Questions. Mac Donald received her B.A. in English from Yale University, graduating with a Mellon Fellowship to Cambridge University, where she earned her M.A. in English and studied in Italy through a Clare College study grant. Her J.D. is from Stanford University Law School. The War on Cops exposes the truth about officer use of force and explodes the conceit of “mass incarceration.” A rigorous analysis of data shows that crime, not race, drives police actions and prison rates. The growth of proactive policing in the 1990s, along with lengthened sentences for violent crime, saved thousands of minority lives. In fact, Mac Donald argues, no government agency is more dedicated to the proposition that “black lives matter” than today’s data-driven, accountable police department. 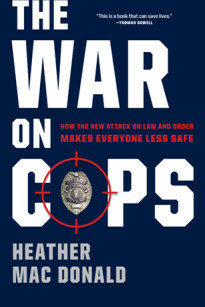 Heather Mac Donald discussed her explosive New York Times Bestselling book, The War on Cops, with our own Ben Weingarten. 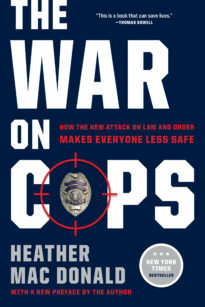 Protestors at Claremont McKenna College and UCLA shut down Heather Mac Donald talks on The War on Cops.